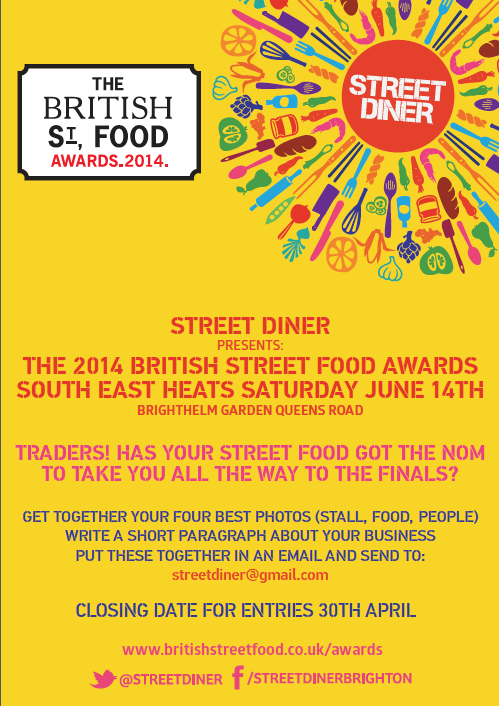 A few weeks ago I wrote about the upcoming south-east heat of the British Street Food Awards 2014 at Street Diner, which, incidentally, has just recently turned one – happy birthday SD! If you want to be part of the action you MUST attend the event on June 14th at Brighthelm Garden, Queens Road Brighton. You’ll need to download the app to cast your vote. The votes will be counted on the day so get involved – bring your mum, dad, your sisters, brothers, great-aunts and uncles – anyone with opposable thumbs and a smartphone! This is your opportunity to be heard, people! Show your support on Facebook, Twitter and spread the word. remembering to use #BSFA in all your posts…so c’mon, what are you waiting for?! The Troll’s Pantry – in my opinion the troll is responsible for the gourmet burger trend that’s hit Brighton in the last couple of years. I wasn’t even mad keen on burgers before I tried one of his but I’m hooked for life. Sourcing local ingredients wherever possible (probably about 99.9% of the time) he creates mouthwatering concoctions such as The Shaman and along with his minions, takes enormous pride in his work, which really shows. The Troll’s Pantry also accommodates the gluten free gang, of which I’m a long-standing member, so his (much-appreciated) efforts to get more local traders onboard with Sussex Bread Company’s wares confirms his spot in my top three. Toston Tolon – prior to Toston Tolon’s arrival at Street Diner, I’d never heard of the Venezuelan Arepa before. Oh boy, was I in for a treat! This little maize flatbread makes a refreshing change to the (highly respectable) Mexican corn tortilla. My favourite is the pulled pork (no surprise there) piled high with black beans and plantain (a favourite fruit of mine that sends me back to my childhood, eating Ghanaian treats at my best friend’s house). Toston Tolon is a worthy contender, I think you’ll agree. Little Blue Smokehouse – these guys had me at “salted chocolate bacon”… Purveyors of smoked delights, they cater to my carnivorous cravings and then some. Keep your eyes on Twitter for their under the counter treats, but shhh! Don’t tell anyone, they’re TOP SECRET! I can’t wait to get my mitts on some pork cheeks and kimchi soon. I thought long and hard about this, and it really was tricky to whittle it down, but I take my judging role very seriously and whittle I did! In fact, I take this judging business so seriously it shows – Hammer & Tongue even picked me for a judge at their recent Fringe event with Scroobius Pip and Hollie McNish at Komedia Brighton!